Earthly Matters now has a special crew that specializes in new gutter installation and gutter repair services! 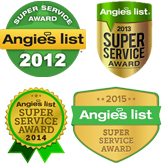 So how can you tell if you are in need of gutter repairs or gutter replacement? Separated gutters. Guttering systems only function if they are fastened together in a continuous channel. If they begin separating from one another frequently, it may be time for a gutter replacement. A large number of cracks, holes, or rust spots. A few of these can be fixed using some sealant and maybe a little flashing. But if you see more than half a dozen sections where this is apparent, then you may want to opt for all new gutters. Flooded basements. Water constantly pouring near your foundation can leak into your basements, where it can do some costly damage. While repairing your basement, you should go ahead and replace your gutters as well. Several broken fasteners. These are the pieces of metal that hold your gutter to your roof and keep it level. If you can repair a few fasteners, great: but if these problems persist, the gutters themselves may be the issue. Nails or screws on the ground. Sometimes, the nails or screws that fasten the gutter to the fascia can work themselves loose. Replacing them isn’t difficult; but again, repeated instances of this may indicate gutter wear. Gutters pulling away from the roof. You can hammer in the fasteners time and again, but if spaces continue to appear between your roofline and your gutters, the fascia boards may be rotting. A gutter replacement will fix the fascia problems along with giving you new gutters. Sagging or improperly-pitched gutters. If a proper pitch is not maintained along your gutter system, the water will pool in certain sections and possibly spill over. 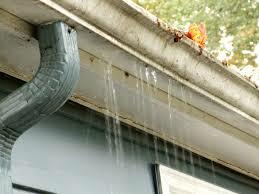 Consider replacing your gutters if you are unable to fix this problem. Peeling exterior paint. When gutters pull away from your roof, the water can seep down over the rear edge and onto your siding or trim. Peeling paint means this has been happening for a while and you should probably replace your gutters. Dirt channels or pooling water. After a rain event, you may notice evidence that water is spilling over your gutters. Try to correct the problem, but consider a gutter replacement if the water doesn’t go away. Eroded landscaping. You work hard to make your landscaping look good. If you must repeatedly invest time and money to repair water damage from malfunctioning gutters, bite the bullet and arrange for a gutter replacement.